WASHINGTON, D.C. -- The percentage of adults diagnosed with diabetes at some point in their lives has risen in 18 U.S. states in less than a decade, according to a comparison of Gallup-Sharecare Well-Being Index data from 2016-2017 versus 2008-2009 data. Diabetes rates did not decline in any states over the same period. 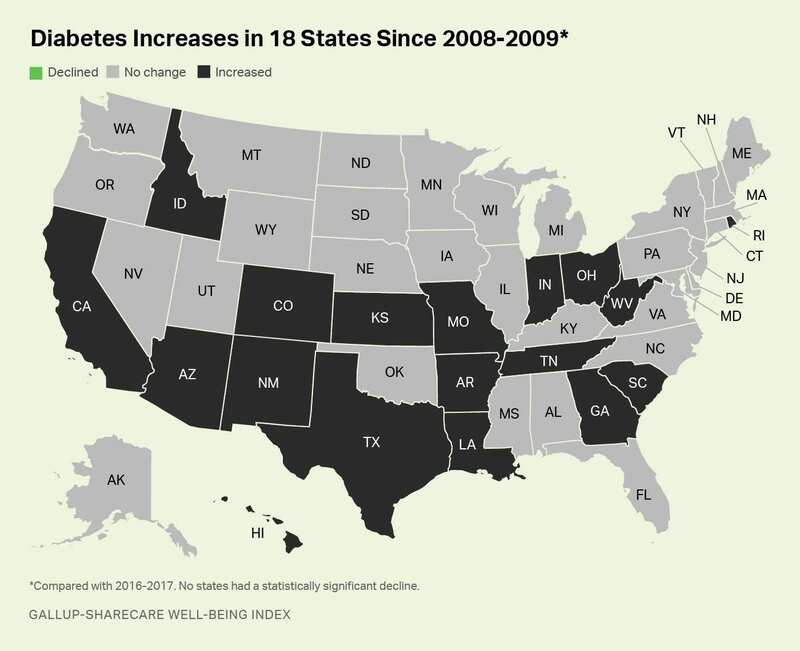 Among the 18 states with reported increases in their diabetes rates, five experienced increases of at least two percentage points: West Virginia, Louisiana, Hawaii, Rhode Island and South Carolina. The remaining states with statistically significant increases are Arizona, Arkansas, California, Colorado, Georgia, Idaho, Indiana, Kansas, Missouri, New Mexico, Ohio, Tennessee and Texas. Nationwide, the diabetes rate rose to 11.5% in 2016-2017, up 0.7 percentage points compared with the 10.8% measured in 2008-2009 and representing a net increase of about 1.7 million U.S. adults who report having been diagnosed with the disease over that time. 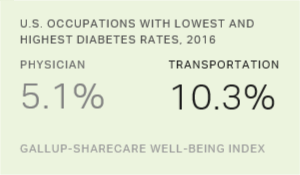 These data, collected as part of the Gallup-Sharecare Well-Being Index, are based on Americans' answers to the question, "Has a doctor or nurse ever told you that you have diabetes?" The state-level data are based on over 709,000 daily surveys conducted nationally from January 2008 through December 2009 and over 337,000 surveys conducted nationally from January 2016 through December 2017. The Well-Being Index does not discern between Type 1 and Type 2 diabetes. Although Colorado is one of the 18 states that had an increase in the percentage of its residents reporting diabetes diagnoses, it remains in rare company nationally as one of only six states with an overall prevalence of under 9% in 2016-2017. Alaska residents report the lowest rate of diagnoses at 8.4%, while Montana, New Hampshire, Utah and Vermont are the remaining states under this threshold. Conversely, West Virginia has by far the highest diabetes rate in the U.S. at 17.9%, about double what has been measured among the lowest six states. Other states with diabetes diagnoses of at least 14% in 2016-2017 include South Carolina, Mississippi, Kentucky, Louisiana, Arkansas, Alabama and Tennessee. One factor likely contributing to the rise in diabetes diagnoses over the past decade is an increase in the prevalence of obesity. Obesity has been shown to quadruple the odds that adults in most age groups will be diagnosed with diabetes, and a rising obesity rate at the state level more than doubles the chances that the state will also be experiencing a rise in diabetes. In the two-year period spanning 2008-2009, 26.0% of U.S. adults were obese, based on calculations of their body mass index (BMI) using self-reports of their height and weight. That figure rose to 28.3% in 2016-2017. This entailed increased obesity rates in 34 states, while obesity declined in none. 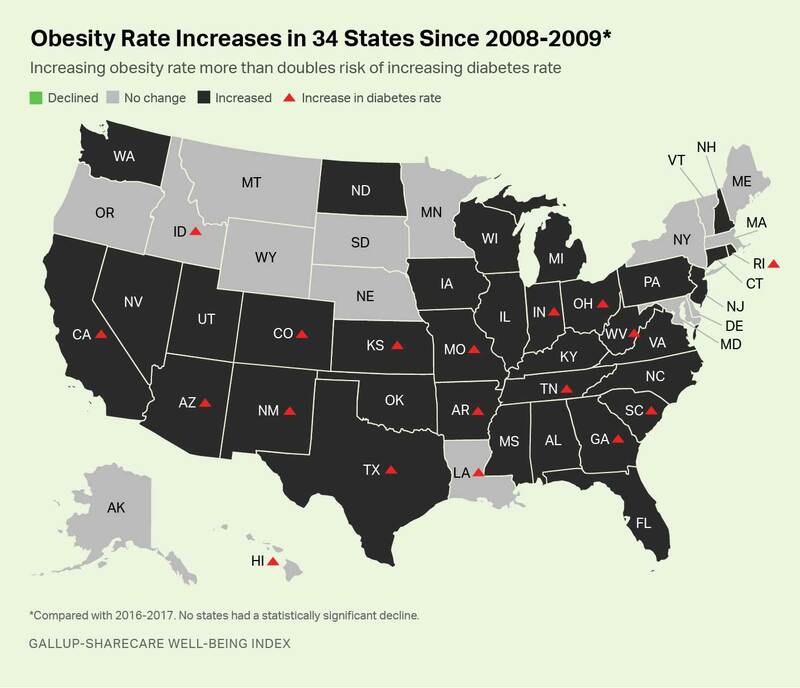 Of the states with increased obesity, 15 -- or 44% -- also had statistically significant increases in diabetes. By contrast, diabetes increased in only three of the 16 states that did not experience significant changes in obesity, or 19%. As such, states with a rising obesity rate are about 2.3 times more likely to also be experiencing rising diabetes prevalence than are states without a rising obesity rate. Generally, states in regions with high overall wellbeing have been more likely to avoid increases in both obesity and diabetes, with states in the Northern Plains, Mountain West and Northeast supplying most of these examples. South Dakota, Vermont, Minnesota, Montana, Massachusetts, Wyoming, Alaska and Nebraska are all among the states with the highest Well-Being Index scores historically, and all have managed to resist worsening national trends for both conditions. 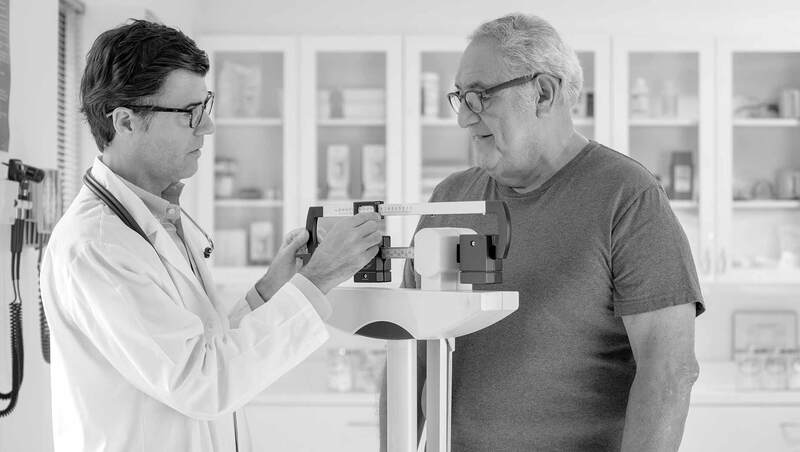 Unlike some government estimates of obesity, the Gallup-Sharecare Well-Being Index uses respondents' self-reported height and weight to calculate BMI and subsequent weight classes. It does not involve clinical measurements that typically result in higher obesity estimates. A BMI of 30 or higher results in an obese classification. Diabetes can result from many factors. Type 1 diabetes is an autoimmune disorder that inflicts about 5% of the U.S. population. It is at least partially linked to genetics, with possible environmental triggers. The far more common Type 2 diabetes is linked to inactivity, family history, smoking, heavy alcohol consumption and high blood pressure. Obesity's link to Type 2 diabetes is particularly well understood because of the known relationship between the accumulation of fatty tissues in the body and the resulting resistance of cells to insulin. Leaders of communities and states can take common-sense approaches to reducing Type 2 diabetes risk factors. For example, plentiful bike lanes and well-organized neighborhoods that allow residents to carry out routine tasks by foot or bike are proven methods for reducing both obesity and diabetes. Public parks and other green spaces that encourage outdoor movement also have strong inverse relationships to both conditions. Local businesses and schools can also be galvanized to do their part. Grocery stores, for example, can promote healthy over unhealthy foods by moving fresh produce and other healthier options to the front of the store so that customers encounter these choices first. Free healthy cooking classes and recipes for home cooking are also a useful approach. Restaurants, in turn, can provide healthy options that are clearly denoted on the menu, along with nutritional information with each menu option so patrons can make informed choices when ordering. And local schools can organize "walking school buses" and restrict unhealthy choices in the cafeteria to help build good eating habits among students. Leaders of businesses can set the agenda in their workplaces to maximize better eating habits and reward good or improving health outcomes of employees by contributing to flexible spending accounts and other tools. Best-practice diabetes management by healthcare providers, in turn, combines education services, innovative outpatient prevention and well-organized self-management processes that are designed to better achieve glycemic targets. And multidisciplinary teams that provide coordinated care are increasingly recognized as clinically effective ways of maximizing the quality of life of diabetes patients. "Healthcare professionals and policymakers must collaborate on how to create environments that give individuals the opportunity to make healthy lifestyle choices," says Sheila Holcomb, vice president, Sharecare. "Only with this type of encouragement will behavior change impact people with diabetes and prediabetes, and lessen the prevalence rate and reduce rising costs associated with its treatment." For a full report on diabetes rates across states and cities nationwide, visit https://wellbeingindex.sharecare.com. Results are based on 709,183 telephone interviews conducted Jan. 2, 2008, through Dec. 30, 2009, and 337,690 interviews conducted Jan. 2, 2016, through Dec. 30, 2017, as a part of the Gallup-Sharecare Well-Being Index, with a random sample of adults, aged 18 and older, living in all 50 U.S. states and the District of Columbia. For results based on the total sample of national adults, the margin of sampling error for the diabetes rate is ±0.2 percentage points at the 95% confidence level. The state-level sample sizes in 2016-2017 range from 879 in Delaware to more than 33,000 in California. For most states, the margin of sampling error is ±1 to ±2 percentage points at the 95% confidence level, but it climbs as high as ±3.5 percentage points for states with small populations such as North Dakota, Wyoming, Vermont and Alaska. All reported margins of sampling error include computed design effects for weighting. Each sample of national adults in 2016-2017 included a minimum quota of 70% cellphone respondents and 30% landline respondents, with additional minimum quotas by time zone within region. In 2008-2009, the cellphone minimum was 15%. Landline and cellular telephone numbers are selected using random-digit-dial methods.